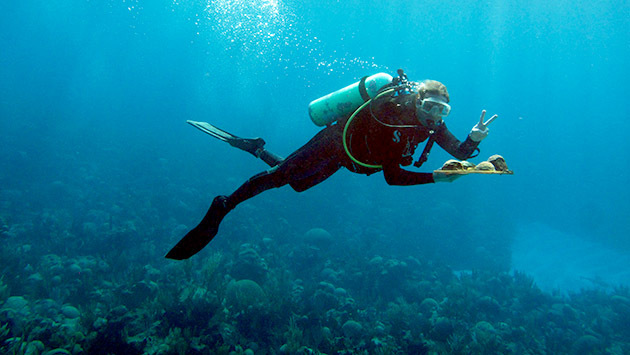 Andreas Andersson collecting coral samples. Ocean acidification is a global problem and an immediate threat to marine organisms and ecosystems. Regardless of the magnitude of the warming that results from increasing atmospheric CO2 concentrations, a topic of uncertainty and ongoing debate, the oceans will absorb a significant fraction of the anthropogenic CO2 that is released to the atmosphere. Over time, this will cause the ocean's water to become increasingly acidic ("ocean acidification"). Corals and coral reefs may be especially vulnerable to ocean acidification because their success is dependant upon their ability to build calcium carbonate (CaCO3) skeletons in a process called "calcification." Scientists don't fully understand the mechanisms of calcification or how they might be impacted by ocean acidification, but one way of addressing this knowledge gap is by studying coral genetics. Scientists can use a "gene-targeting" approach that investigates only the expression of genes known to be involved in calcification; however, this approach is limited in scope. Researchers in the BEACON Lab and Molecular Discovery Lab at BIOS are taking a new approach and investigating genome-wide effects of ocean acidification on corals. By using controlled laboratory experiments, they aim to create profiles of differences in gene expression between colonies of the hard coral Diploria strigosa (symmetrical brain coral) that are maintained in water with varying levels of CO2. The key outcome of this research is the identification of a suite of genes whose expression is modified by CO2 concentrations. This suite of genes will then serve as a starting point for understanding how coral physiology will be affected by ocean acidification.